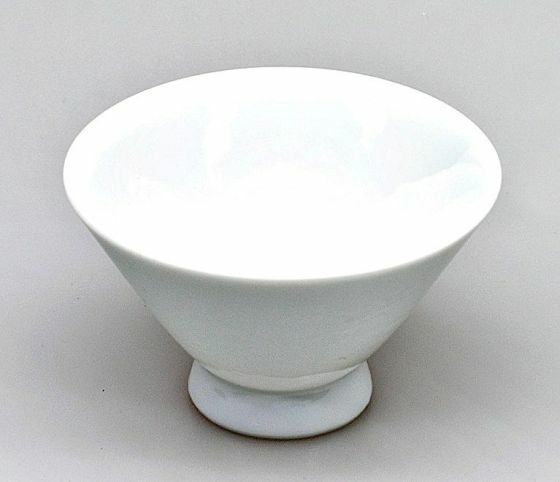 Japanese teacup (Chawan), white, 100ml, 8.2 x 5 cm. The small Japanese ceramic tea bowl in elegant white color and characteristic flat tapered design is perfectly suitable for the enjoyment of Japanese green tea or any other type of tea. The small size of this Japanese teacup is particularly beneficial for tea samplings, to fit larger tea rounds with limited teapot capacity, or for delimiting caffeine intake per cup with extended samplings or in the case of caffeine-sensitivity. The chawan, which is both the Chinese and the Japanese word for teacup, had been brought to Japan from China starting from the 13th century, but just as with their characteristic side handle teapots (Kyusu), the Japanese soon began to develop and produce their own design preferences, resulting in the typical tapered Japanese teacup as we know it and being popular in Japan today along with the taller and straighter “Yunomi” design. Similar to the popular Chinese method of brewing tea in a gaiwan as an alternative to using a Chinese teapot, the Japanese teacup is often not only used to drink tea, but also to prepare it in the first place. This applies especially to Japanese Matcha tea, where Matcha teacups are frequently used to prepare Matcha tea before drinking it from the same cup. Click here to seee our choice of Matcha teacups. Nice cup, perfect for green teas and oolongs. Considering getting another one although I don’t really need it. The lower “lip” is very thick/tall, so the bottom doesn’t get hot. In the end I did buy another one so I have a pair:) Goes well with my white porcelain teapot.